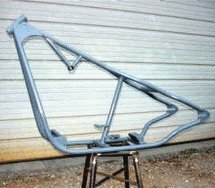 If You Want To Mig Weld Aluminum Read This Entire Report! Tig welders will tell you that you shouldn't mig weld aluminum because it's too frustrating. But the good news is that welding machines and spool guns have come a long way so you don't have to learn how to Tig weld or buy a Tig machine if you simply need to weld .0125 or .25 aluminum. So the bottom line here is if you want to use a mig welder to weld aluminum I strongly recommend using at least a 230v welder. In order to get good penetration with aluminum or any metal for that matter you need to get deep in the material to achieve proper fusion. So, you need proper power to get the penetration you need for this. 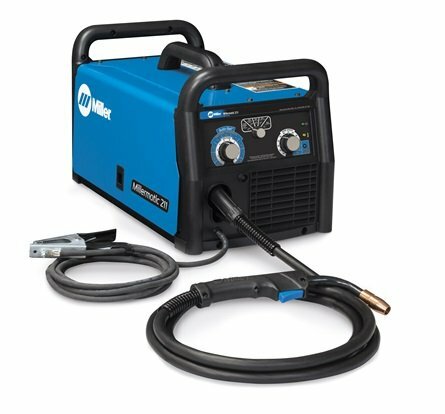 A 230 volt mig welder (or above) will provide you with enough penetration. A 115v or older 110v welder does not provide enough power and therefore heat to get the penetration required for a good weld. You need the power from the welder to create enough heat to melt the aluminum in order to get good fusion because aluminum absorbs a lot of heat, which you would think it do the opposite because it’s a softer metal than steel, but it does. The simplest way to explain this is that in order to increase heat to weld aluminum with a mig welder is to either increase amperage or use a welding machine with a bigger transformer. A welder with a bigger transformer means you are going to spend more money. You will find people on forums that will tell you they can weld aluminum with a 110v or 115v mig welder. I am sure there are people out there who can do it. But they probably spent a lot of time messing with the gas and settings for power, gas, and wire feed speed and technique to achieve a decent weld. If you are not a well seasoned welder of aluminum you are going to go through a lot of frustration welding aluminum with a 110v or 115v mig welder. How To Weld Aluminum With A 110v Mig Welder! Use 5356 wire because it’s a stiffer wire which you’ll need because it will not jam up in the gun as much. Make sure your aluminum is clean as can be. Use a stainless steel brush as well as acetone to wipe off all the residue. Preheat the aluminum with a torch methylacetylene propadiene propane (MAPP) gas torch. You can also use an Oxy acetylene torch but I prefer MAPP. This will help you get better penetration and fusion of the weld. Use a wire speed around 6 to 7 which is quite fast for a Mig welder. Play with it. Loosen up the wire feed rollers in your machine because if they are tight the wire will jam and bunch up which you probably know by now is a pain in the rear. Best Mig Welding For Welding Aluminum! Save yourself the frustration. My advice is to get yourself a good 230v mig welder and a spool gun for welding aluminum or steel. It can be done and below is a recommendation for both 110v (115v) and 230v welders. Best Option #1: If you know what you are doing and you really want to buy a lower cost quality 110v mig welder, consider the Power Mig 140C (part number K2471-2). 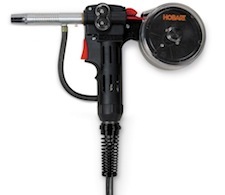 With this machine you will also need to get the Magnum 100sg spool gun (part number K3269-1). This combination will allow you to weld up to 12 gage aluminum. But iff thicker material needs to be welded and you want a frustration free aluminum and steel welding machine, the Power Mig 210MP is your best choice because it will plug into 110V or 230V and it’s a smooth operator. 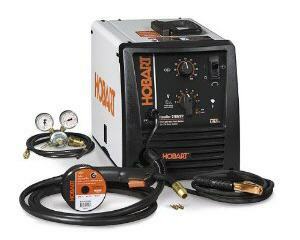 When plugged into 230V this machine will weld up to 3/16" aluminum. And it’s a Lincoln! Option #2: A quality unit that will operate on 110 and provide spool gun support is the Handler 210MVP. It is capable of operating on 115 or 230 input and is spool gun ready. This is a great choice and it’s right up there with the Lincoln 210MP above, so either one is a good choice. You'll need to buy the Spoolrunner 100 separately for this machine. Option #3: The Millermatic 211 and a Spoolmate (sold separately). The Miller and the Lincoln companies are considered to be the cream of the crop and their machines are usually a little bit more expensive than other welding machine manufacturers. With that said, Hobart is owned by Miller so you can stamp that brand on it. The Millermatic 211 and the Spoolmate 150 is the way to go if you are comfortable forking over several few hundred more dollars than the Hobart. You really can’t go wrong here. They often have rebate offers for their machines. At the time of this writing, there is a $100.00 rebate on this unit until and if you purchase the spoolgun also you can receive a $300.00 rebate. 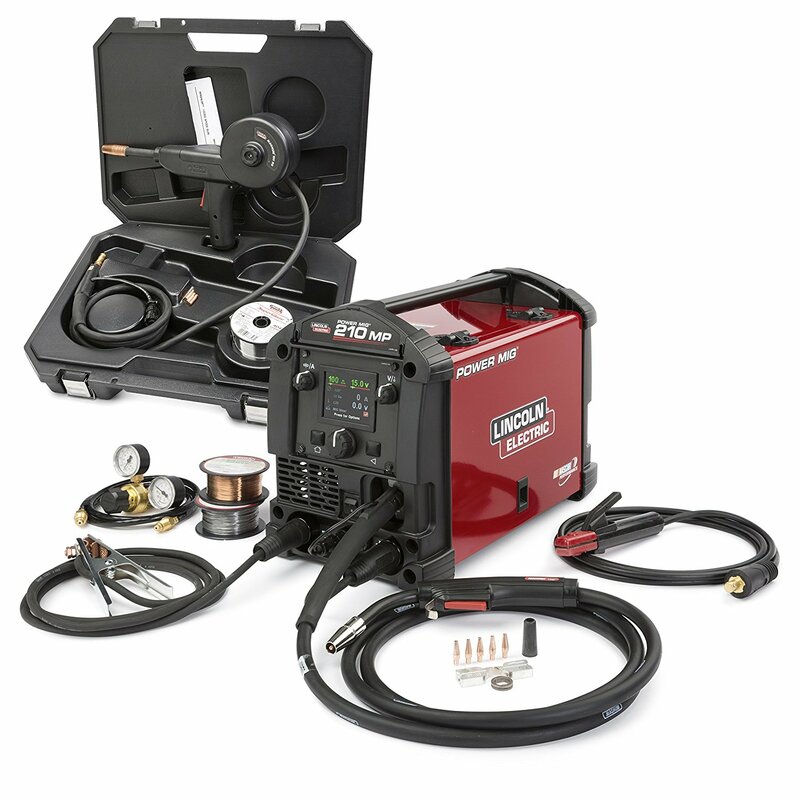 Option #4: Another option that will save you a lot of money without sacrificing too much quality is the Eastwood 175 AMP MIG Welder with Spool Gun. They build their machines overseas, but they have offices and a warehouse in the USA. This unit specifications are as follows. Personally I am really big on buying products built in the USA, and I am also a big believer in good support for the products I buy. When it comes to support the best support I have recieved by far is from Lincoln, and in second place is Hobart, and then Miller. Even though MIller owns Hobart they are still separate in many ways. 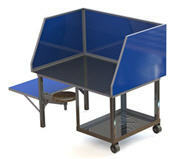 So what I am saying is you should consider this as you look at saving money, I strongly encourage you to include the overall quality of the product which includes service and support.